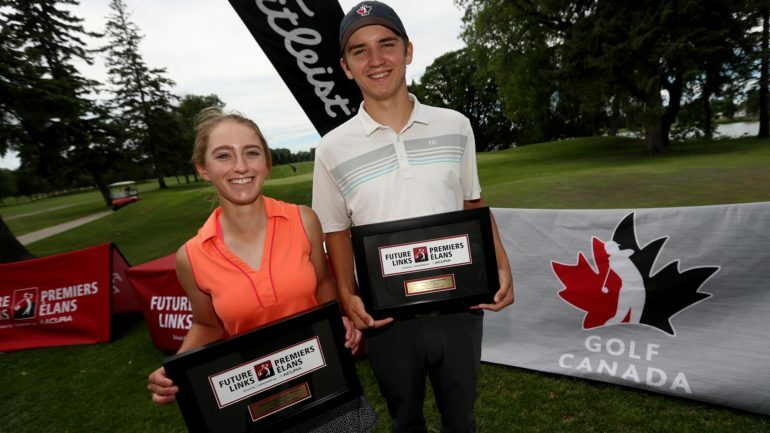 PORTAGE LA PRAIRIE, Man.— Wesley Hoydalo and Sydney Scraba shot 2 under and 13 over, respectively, to emerge victorious at the Future Links, driven by Acura Prairie Championship at Portage Golf Club on Sunday. The junior boys, who failed to score in the red after two tough rounds, brought their A-game to the final day. With three sets of consecutive birdies across his final 18 holes, Wesley Hoydalo, who started the day sharing the lead with Saskatoon’s Bradley Moser, fought hard to emerge victorious in the junior boys division. The Selkirk, Man., talent was the only player to finish under par at the tournament at 2-under-par 208. Next up for the 18-year-old is the Elmhurst Invitational, where he will compete for an exemption into the Canadian Amateur Championship. Calgary’s Jakob Chicoyne put on a spectacular show, fighting hard during the final day to tie with Hoydalo for a tournament low (66) and earn a piece of second alongside Bradley Moser of Saskatoon, Sask., at 1-over-par 211. Gerry Mei of North York, Ont., Sylvain Ruest of Winnipeg, Man., and Jacob Armstrong of Winnipeg, Man., all shot 10-over-par 220 to tie for fourth and earn exemptions into the 2018 Canadian Junior Boys Championship on July 30-Aug. 2 at Medicine Hat Golf & Country Club in Medicine Hat, Alta. The course proved to be challenging for the junior girls during the final round of the tournament but Sydney Scraba managed to hold on to her lead, carding a 7-over to secure a four-stroke victory in the junior girls division at 13-over-par 229. The 17-year-old started the tournament tied for fourth but moved up the leaderboard on Saturday after being the only junior golfer at the tournament to score under par after two rounds. Michelle Liu of Vancouver, B.C., ended the tournament in second at 17-over-par 233 while Bobbi Uhl claimed third at 19-over-par 235. Rounding out the top-six earning exemptions into the 2018 Canadian Junior Girls Championship on July 31-Aug. 3 at Beach Grove Golf Club in Tsawwassen, B.C. are Vanessa Zhang (Vancouver, B.C. ), Jillian Friyia (London, Ont.) and Sandee Park (West Vancouver, B.C. ).